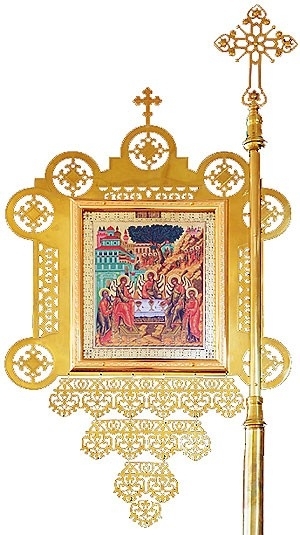 Orthodox processional church banners. Brass, lithography, partial gold-gilding. I have received the parcel and the white Priest's vestment is very beautiful! We received our vestments and they are beautifully constructed and fitted, and the fabric is very fine, so please relate this to the people who made them, as they deserve to receive compliments for such good work. Christ is risen! Khristos voskrese! The order for my Deacon vestments arrived today and looks great. Thank you!